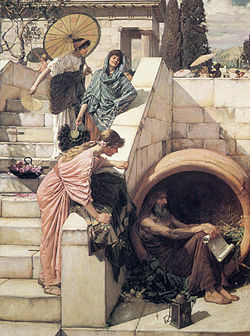 Diogenes by John William Waterhouse, depicting his lamp, tub and diet of onions. Diogenes of Sinope (412 or 399 B.C.E. – 323 B.C.E.) was an ancient Greek philospher and one of the founders of the Cynics. He was exiled from Sinope for adulterating the currency and went to Athens, where he became a follower of Antisthenes. Taking the precept that “virtue is the only good, all else is evil,” he practiced a life of ascetic self-sufficiency. He was known for his blatant disregard for social niceties and for the abrasive manner in which he spoke to people. Diogenes lived for a time in a tub, and wore only a cloak and carried a staff and a wallet containing his food, attire that became a Cynic trademark. He emphasized action over words and thoughts, and disparaged theoretical philosophy, mathematics, astronomy and metaphysics as being removed from reality. Many colorful and amusing stories are told about him. He is credited with establishing the tradition of Cynicism that was carried on by Crates and later became a foundation for Stoicism. Diogenes was held in high esteem by the people, who honored him at his death with a tombstone bearing a dog—an animal to which he often compared himself. Diogenes was born in Sinope (Sinop in modern-day Turkey) about 412 B.C.E. (according to other sources 399 B.C.E.). The primary source for information on Diogenes is the Lives of Eminent Philosophers written by Diogenes Laertius around 400 C.E. Diogenes was exiled from Sinope for adulterating the coinage; one account says that his father was a money changer and defiled the coinage, another that he directed Diogenes to do it, and another that Diogenes went to an oracle who instructed him to defile the coinage. Numismatic evidence shows that the currency of Sinope was adulterated, but it is not certain that this was done by Diogenes. Upon arriving in Athens, Diogenes encountered Antisthenes. According to Lives, Antisthenes did not accept pupils and tried to repel Diogenes, but he persisted. On one occasion Antisthenes threatened to hit him with a heavy stick, but Diogenes said, "Strike, for you will not find any stick hard enough to drive me away as long as you continue to speak." Diogenes took Antisthenes’ precept that “virtue is the only good,” and followed him in an ascetic lifestyle intended to liberate the soul from the deceptive influences of pleasure, luxury and fame. Diogenes’ determination to live simply and completely in accordance with nature led him to extremes. As training, he walked barefoot in the cold and rolled in hot sand during the summer. He observed a mouse running around, “not seeking for a bed, nor taking care to keep in the dark, nor looking for any of those things which appear enjoyable to such an animal,” and realized that he also had no need of the things which ordinary people considered necessities of life. He threw away his bowl after he observed a child drinking water from his cupped hands, and his spoon when he observed a boy scooping up lentils with a piece of flat bread, because he no longer needed them. He doubled up his cloak to sleep in it, carried his food in a wallet, and carried out his daily activities wherever he happened to be at the time. Diogenes Laertius relates that he often pointed to public buildings and remarked "that the Athenians had built him places to live in." When the people reproached him because, contrary to common etiquette, he ate in the marketplace—he replied that the marketplace was where he felt hungry. When a landlord delayed in preparing a small cottage for him, Diogenes instead took up residence in a cask that belonged to the Temple of Cybele. Many anecdotes concern repartee between Diogenes and Plato, and between Diogenes and Alexander the Great, and illustrate his deliberate disregard for fame and political power. Diogenes’ manner was direct and sometimes abrasive, and his behavior earned him the nickname “dog.” He referred to himself numerous times as a dog, and the dog later became a symbol for the Cynics. Lives reports, however, that Diogenes was very persuasive, and that his followers refused to leave him. Diogenes apparently spent a part of his life as a slave in Corinth. On a voyage to Aegina he was captured by pirates and sold as a slave in Crete. Being asked his trade by the auctioneer, he replied, “governing men,” and, pointing out a Corinthian named Xeniades, said "Sell me to that man; for he wants a master.” He lived in Corinth until his death, and became tutor to the two sons of Xeniades and manager of the household. Lives relates that he educated the two sons to live an austere life and to be well-rounded both in their studies and in practical matters. Diogenes died in 323 B.C.E. at Corinth, according to Diogenes Laërtius, on the day on which Alexander the Great died at Babylon. There are several accounts of his death; one, that he ate a raw ox’s foot; another, that he was bitten by a dog and died several days later; and a third, that he held his breath until he suffocated. He was buried by the elders of the city, and a pillar bearing a dog in white marble was placed on his grave. Diogenes Laertius says that several works are attributed to Diogenes of Sinope, but that there is no certainty that he was the author of any of them. None of the written works of the early Cynics have survived, and their ethics and philosophical thought have to be understood through the anecdotes and repartee reported by later writers. The concise wit and the humor of these stories suggest that they were polished and embellished from many retellings, and that many are probably exaggerations. Of the three founding Cynics, Antisthenes, Diogenes and Crates, Diogenes is considered to have been the most radical and the one who laid down a substantial foundation for the Cynic tradition. The Cynics valued three types of freedom, self-sufficiency, freedom of will, and freedom of speech. The first freedom, self-sufficiency, was brought about through living a life of simplicity and asceticism, thus reducing desire to only those things which were necessary for human subsistence. Both the Stoics and the Epicureans later adopted a similar stance, that a person could easily satisfy his physical needs if he kept them simple. Diogenes valued humble labor, and spoke about the need to train both the body and the mind, because a weak body could not act in pursuit of virtue. He often advocated eating a simple diet in order to maintain a healthy body, and mocked the overindulgence of the wealthy. Freedom of speech meant the freedom to speak frankly, without fear of punishment or of judgment by one’s audience. Diogenes went about correcting people and pointing out their follies. His own ascetic and self-disciplined lifestyle gave him the authority to criticize others for being self-indulgent or immoral. His lack of political obligations left him free to comment on civic affairs without fear of reprisal. On several occasions when his provocations occasioned some kind of violence against him, he received the support of the Athenian people who recognized the injustice that had been done to him. Diogenes clearly believed that accomplishments during this earthly life held much more importance than any reliance on an afterlife. Diogenes had little interest in science, metaphysics, theoretical philosophy, or the syllogisms and sophisms which were common among philosophers of his time. He said that, “mathematicians kept their eyes fixed on the sun and moon, and overlooked what was under their feet.” When a man was speaking about heavenly bodies and meteors, he asked, "Pray, how many days is it since you came down from heaven?" He was a nominalist, believing only in the reality of what could be perceived by the senses. He told Plato that he could see a cup, but not “cupness,” and Plato replied that Diogenes was not yet ready to see “cupness.” On one occasion Plato attempted a definition of a human being as “a two-footed, featherless animal.” Diogenes plucked a chicken and brought it to Plato, saying, “This is Plato’s man.” The story goes on to say that Plato added, “with broad nails,” to his definition. Although he attacked Greek culture and the values of the society in which he lived, Diogenes valued virtue and moral integrity very highly. Like his student Crates, Diogenes seemed to have a vocation to provoke others into elevating their understanding of moral value, and for promoting virtue in others. A famous anecdote relates that he walked around with a lamp in the daylight, saying that he was searching for a true man. He wondered why men competed with each other by kicking and punching, and not by emulating virtue. He belittled athletes, saying that they were made mostly of beef and pork. To a young man who said he did not think he was fit to be a philosopher, Diogenes asked, “Why live, if you can’t live well?” He remarked that musicians were anxious to perfectly tune their instruments, but left the habits of their souls ill-arranged; that orators were anxious to speak well but not to act well; that grammarians desired to learn all about the misfortunes of Ulysses but were ignorant of their own misfortunes. To a young man who was studying philosophy, he said, "Well done; inasmuch as you are leading those who admire your person to contemplate the beauty of your mind." Branham, Bracht and Marie-Odile Goulet-Caz・ eds. The Cynics: The Cynic Movement in Antiquity and Its Legacy. Berkeley: University of California Press, 1996. Dudley, D. R. A History of Cynicism from Diogenes to the 6th Century C.E. Cambridge: Cambridge University Press, 1937. Long, A.A. and David N. Sedley, eds. The Hellenistic Philosophers, Volume 1 and Volume 2. Cambridge: Cambridge University Press, 1987. History of "Diogenes of Sinope"
This page was last modified on 23 October 2017, at 15:17.